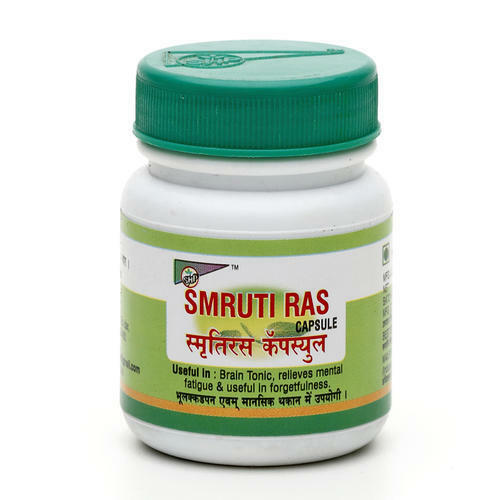 We manufacture and export the wide range of Smurti Ras Capsule and offer to our valuable clients. Smruti Ras is for the improvement of memory. Indicated for short term and long term memory for all age groups. It also promotes the Concentration and intelligence, also useful in depression. Smruti Ras is very useful particularly for students, office executives, and businessmen who are doing very heavy mental work and also in mentally retarded persons. Established in the year 1996, Shriji Herbal Products is one of the well recognized manufacturers and exporters of Ayurvedic Medicines, Herbal Health Care products, Herbal Skin & Hair Care Products, Classical Ayurvedic products and proprietary products. Late Vd. Mahendra Trivedi is a founder of our organization .His affiliation and love to Ayurveda was tremendous. He saw the vision and need of people for best quality of Ayurvedic medicines. Whole life he dedicated Ayurvedic only. Now this traditional company is been managed by his two sons Dr. Dilip Trivedi Ayurveda Acharya who is renowned Ayurvedic physician has treated thousands of patients, still practicing at Mumbai (Borivali). Our products are the zest of his experience Another Jayesh Trivedi is commerce graduate and he look after the management. Under this two brothers company is progressing at rapid pace.Shriji Herbal Product is a trusted name in Ayurvedic Industry for its Diabetes, Osteoarthritis, Psoriasis, Acne, Sinusitis, Acidity, Piles, Constipation and many more.